Buma ROCKS!, the international conference and showcase festival for loud music, is affiliated to FortaRock In The City, the metal festival in venue Doornroosje, Nijmegen, on Saturday 27 May. Through January and February a total of 145 bands from all heavy sub-genres applied for a Buma ROCKS! showcase slot during the festival. Rotterdam band DOOL is the first act to be chosen by the showcase commission, with two more acts to be announced in the next few weeks. Earlier this year Buma ROCKS! added The Charm The Fury to the festival line-up. Ticket sales for FortaRock In The City including Buma ROCKS! have started at www.doornroosje.nl. It obviously didn’t matter in the selection process, but it is still nice to mention that DOOL were the very first act to apply for a showcase gig when registration on the Buma ROCKS! website opened in January. With their three-guitar-attack, the Rotterdam-based band fronted by Ryanne van Dorst (Elle Bandita) played an impressive gig at Eurosonic in Groningen. 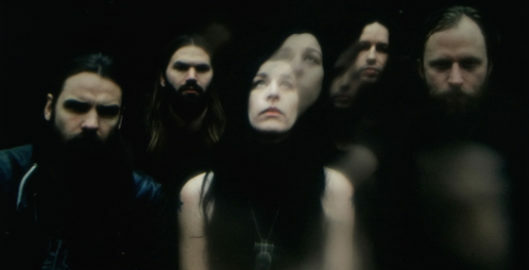 The melodic songs on their debut album Here Now, There Then (released in February) offer a mix of dark rock, gothic pop, gloomy psychedelic rock and metal. With the addition of DOOL to the FortaRock In The City programme (The Charm The Fury, Decapitated, Periphery, The Contortionist, Destrage) the festival becomes even more rich in variation. The last two Buma ROCKS! showcase acts will be chosen shortly from the remaining 144 applications by the kind people of Buma ROCKS!, Doornroosje and FortaRock. Hard rocking Studio Brussels DJ duo Goe Vur In Den Otto (Jan Vermeerbergen and Pieter-Jan Symons) will spin the records during FortaRock In The City’s afterparty. During the day’s programme they will be presenting The Wheel Of Steel Rock Quiz in the Doornroosje cafe. The Rock Quiz has seen teams from as varied a background as Paaspop, 013, Wacken Open Air, Podium Duycker, Appelpop, Mojo and the VVD battling it out during the Eurosonic Noorderslag conference earlier this year. Saturday 27 May, 14.00 – 00.30, Doornroosje, Nijmegen. With a.o. match making sessions, Buma ROCKS! Export Award ceremony, The Wheel Of Steel Rock Quiz and performances of DOOL, The Charm The Fury, Decapitated, Periphery, The Contortionist, Destrage. Tickets FortaRock In The City through www.doornroosje.nl.